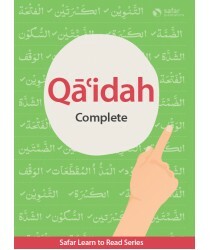 At Safar Academy we use our own, unique Qaidah compiled by our Development Team and is now taught in..
ADDITIONAL INFORMATIONWEIGHT0.63 kgDIMENSIONS17.6 x 25 x 1 cmPAGE COUNT145PAGE SIZEB5..
WEIGHT0.56 kgDIMENSIONS17.6 x 25 x 1 cmPAGE SIZEA5PAGE COUNT101..
WEIGHT0.63 kgDIMENSIONS17.6 x 25 x 1 cmPAGE COUNT145PAGE SIZEB5.. The Safar Juz ʿAmma is part of the Safar Learn to Read series. It should be read after completi..
Rules of Tajwīd, is a sequel to the Safar Qāʿidah and part of a comprehensive Safar Learn to Read Ta..
Safar Schemes of Work (SOW) covers all teaching aspects and textbook material in a detailed manner f..
ADDITIONAL INFORMATIONWEIGHT0.67 kgDIMENSIONS17.6 x 25 x 1 cmPAGE SIZEb5PAGE COUNT126..
ADDITIONAL INFORMATIONWEIGHT0.67 kgDIMENSIONS17.6 x 25 x 1 cmPAGE SIZEB5PAGE COUNT118..
ADDITIONAL INFORMATIONWEIGHT0.72 kgDIMENSIONS17.6 x 25 x 1 cmPAGE SIZEB5PAGE COUNT140..